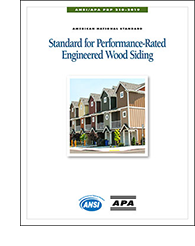 Download ANSI/APA PRP 210-2019 — Standard for Performance-Rated Engineered Wood Siding. View the current ANSI/APA PRP 210 Membership Roster. To apply for membership, download the PRP 210 Committee Application Form. There is no active ballot available to download at this time.